Beach party lovers make hey! hey! in the moonlight... While the monster lurks in the shadows! A gang of surfers is hanging around the beach, dancing to surf tunes and riding the waves. One of the lightly clad girls starts to tease one of the boys and he starts to chase her, but she outruns him pretty quick, and finds herself at the entrance to a cave on the beach. She pays little attention to the cave, and does not notice the thing that comes out of the cave towards her. 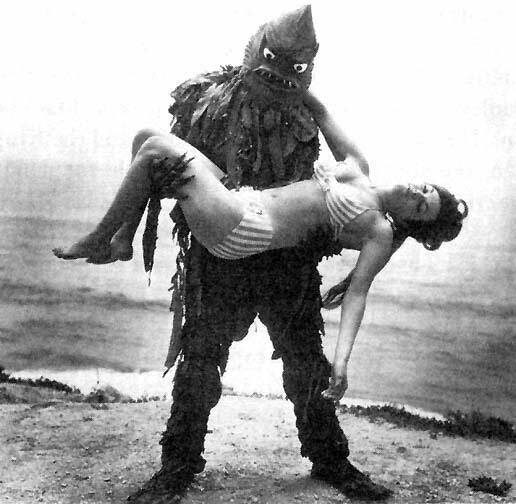 A horrifying creature that drags itself to her, and then attacks her, leaving her clawed body on the beach and then runs back into the cave. Soon after the mauled body is found by one of the other girls in the gang and the authorities are notified. The police find some large footprints in the sand where the girl was killed, footprints to big and weird to come from a human. The sheriff talks to a local scientist, Otto Lindsay, who’s an expert on fish and sea creatures and he believes that the footprints are those of an enormous fish capable on living on land, a fish normally found in Africa. But he also mentions that the footprints are even larger than those of the fish, and perhaps the one that attacked the girl is a mutation of some sorts. Th e police are still convinced that the killer they are after is a human and continues their search. Meanwhile one of the young men of the surfing gang, Richard Lindsay, happens to be the scientist’s son, and Otto does not like the fact that his son hangs out with the surfers and the girl’s witch he refers to as “tramps”. Otto wanted his son to follow in his footsteps and study oceanography, but Richard wants to have fun and live his life before he gets to old. The relationship between Otto and Richard continues to be soar as Richard is feeling trampled by his father and picked on by his stepmother Vicky. 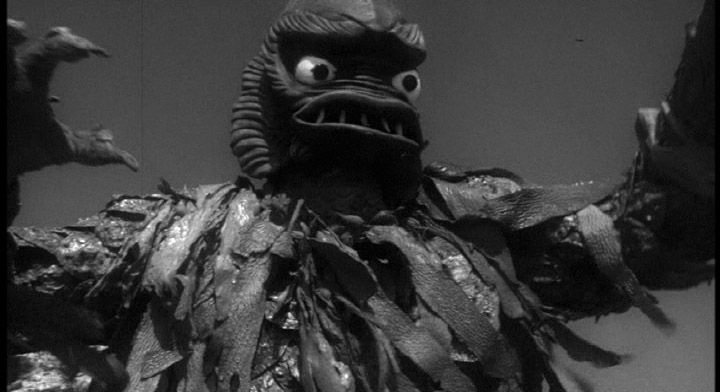 But somewhere out there on the beach there is still a killer loose who stalks and attacks more teenagers from Richard’s surf gang. Beach Girls and the Monster is an entertaining little spoof portraying the popular surf scene in the mid 60s. 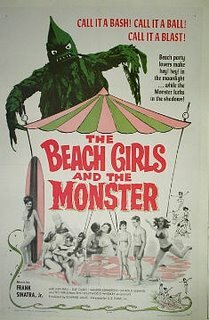 The film is filled with light clad gals who shakes their bum to the catchy tunes of surf music and guys riding the waves, and in the middle of this a “horrible” creature who’s set out to kill the teenagers. The film was directed by Jon Hall (who also plays Dr. Otto Lindsay in the film) and has a lot of promise as a good little creature feature, but there is perhaps a bit to much melodrama caught in the middle of this that might take some of the interest away from some viewers. The music in the film however is a catchy and cool mixture of Fran k Sinatra Jr’s jazz driven score and funky surf music and works very well for a movie like this. The climax of the film, suffers again from the more melodramatic parts of the feature, and it ends up as a rather disappointing Scooby Doo like ending. But if you have an ache for some old school surf horror one rainy Saturday, or if you are into no budget drive in horror you should check this one out, surf tunes, girls in bikinis, and a goofy looking monster gets a thumbs up in my book!